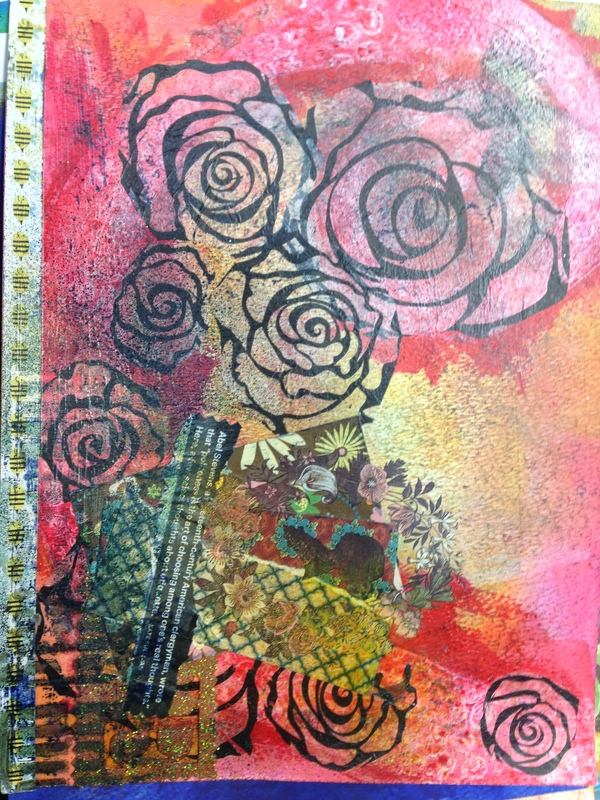 So below is my DLP, week 13 (March 28, 2015) challenge art journal page. 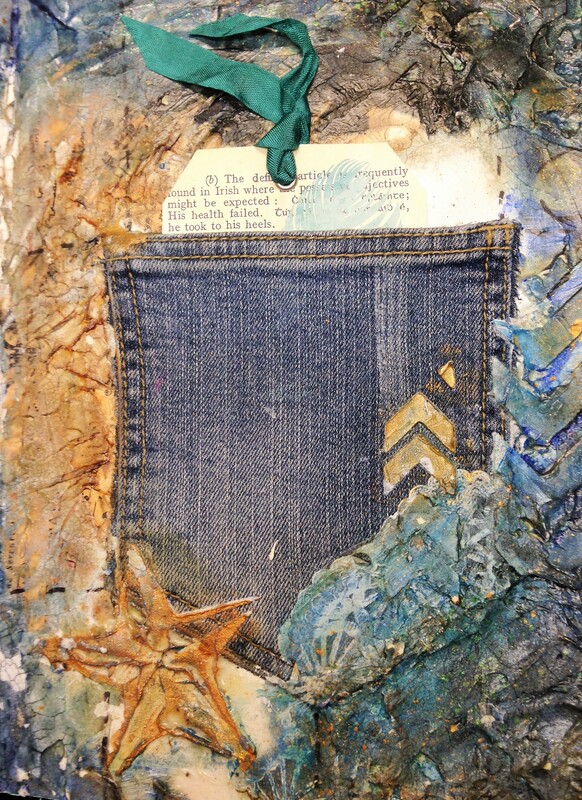 I used a ton of modeling paste, some crackle paste, stencils, acrylic paint, distress ink, Distress stain, a jean pocket and a tag with the saying, “Ride the energy of your own unique spirit” Gabrielle Roth. After the page had “cured.” I say cured because it really only sat out overnight. I covered the page in a semi-gloss gel medium. This helps the page from becoming brittle and flaking as the substrate (the journal page) is flexible which isn’t always good for modeling paste and really not good for crackle paste. I also like the sheen and depth the gel medium gives the page. 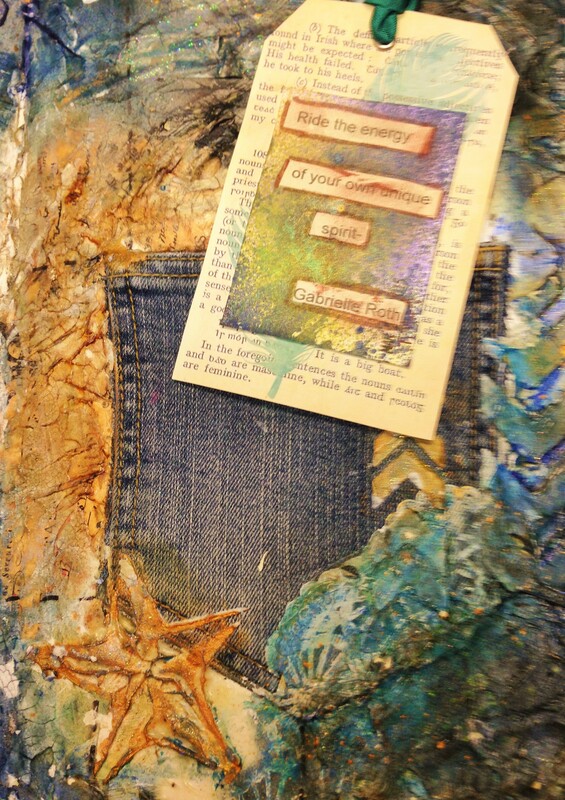 I have worked in an art journal off and on for years. Sometimes I work through a class, workshop or Internet prompt and sometimes I work on my own. 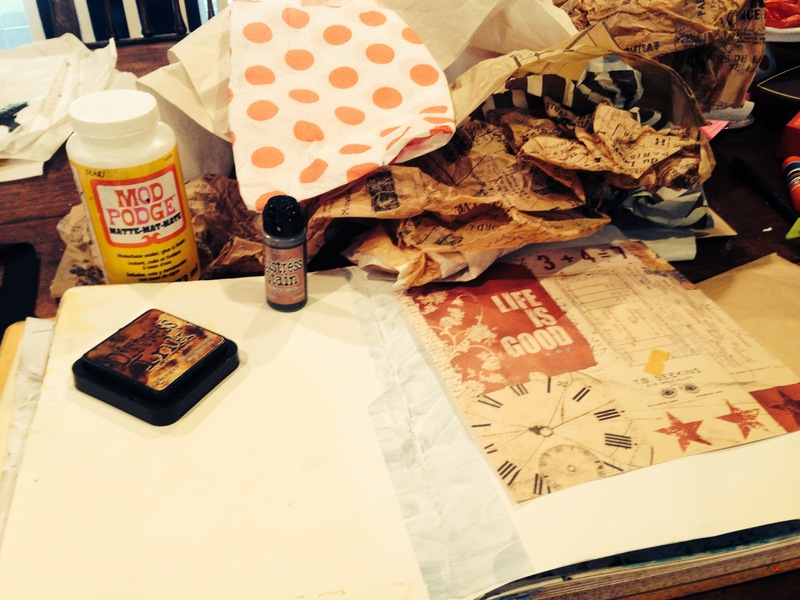 This year I am participating in the Documented Life Project. I am loving the workshop. Check it out at http://www.art5academy.com/the-studio/the-documented-life-project-free. It seems to be a perfect mix of styles, artists and prompts for me. Having just told you about DLP I am actually sharing a journal page not from DLP. Aahh, the oddities of blogging. So on goes the post. 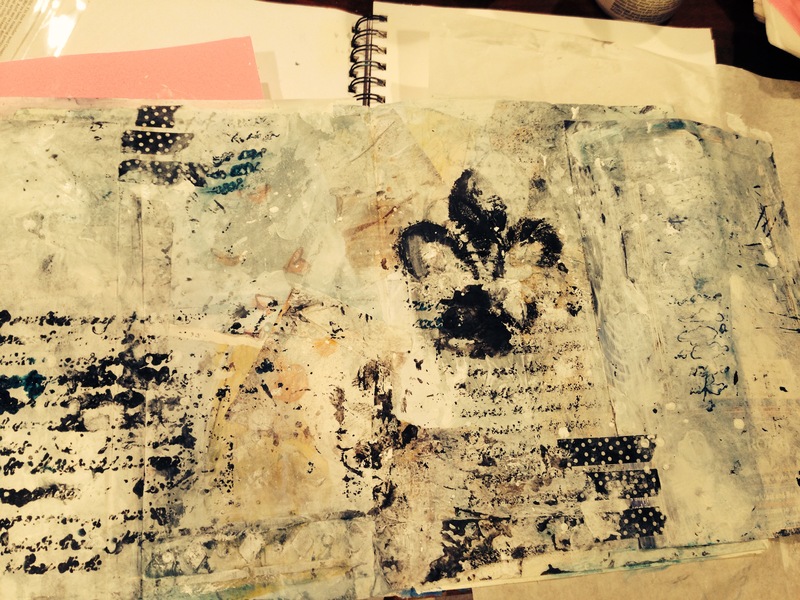 I am sharing a page from an archived Art Journal. 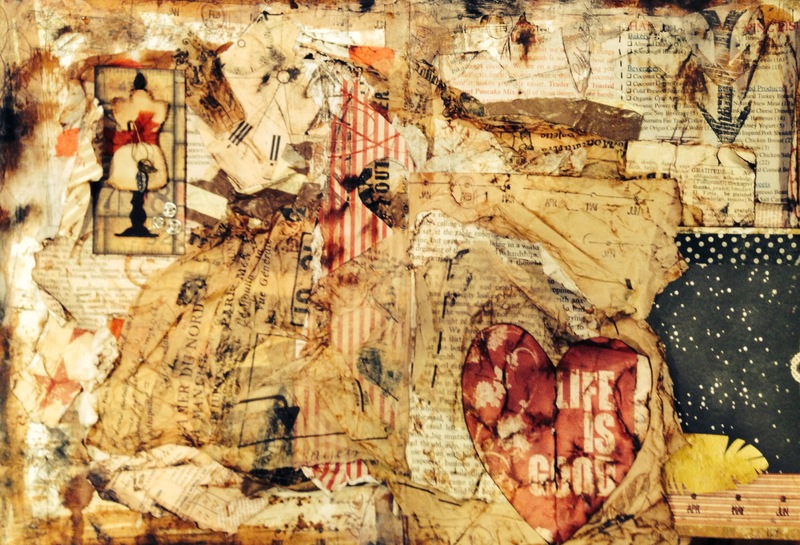 I used tissue paper, acrylic paint, stains, magazine images and other ephemera. 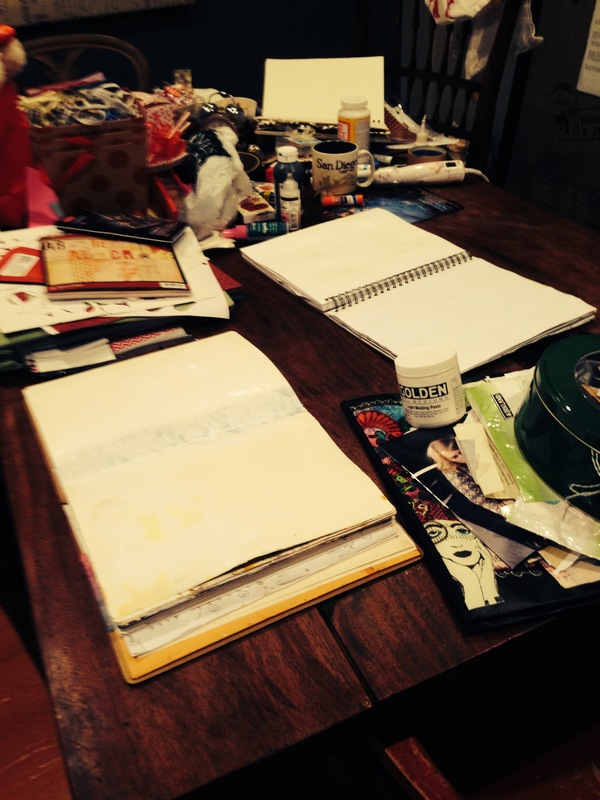 When I first started Art Journaling I was in high school (which was just last year OR…maybe 30 years ago), back then I didn’t call it Art Journaling. It was my sketchbook and into went everything. Some of it was mixed media, some was technique, some pencil drawings, some reflections. Sounds just like an Art Journal, but it was a sketch book (ha!). I think there are many fine artists that carry a sketchbook and journal, draw, write, save ideas, etc in it. Whatever you want to call it. 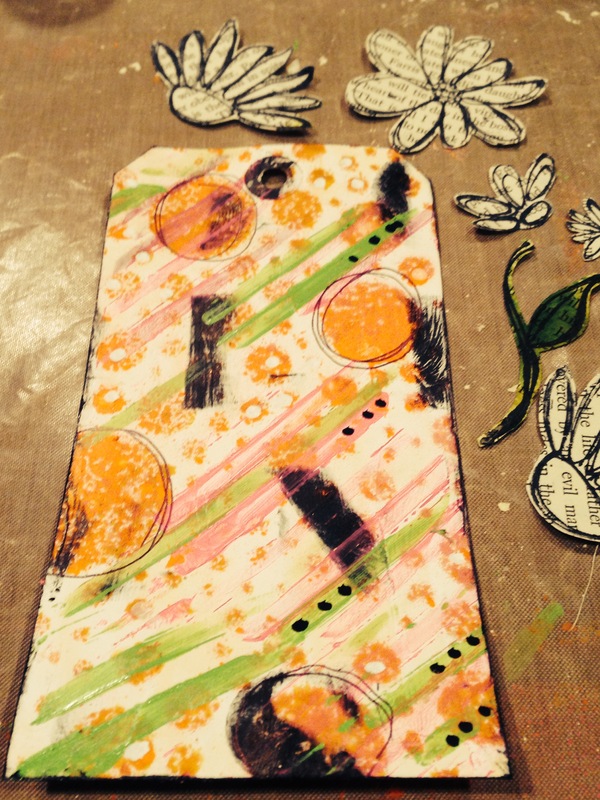 It’s a great tool to provide you with a creative outlet that needn’t be perfect. . Enjoy my joy and imperfection. Hi. Hello. I am so excited to share this tag as it not only showcases some great technique, it’s pretty and my baby boy (who is 10) took this amazing picture of it. I think the picture is just stunning! He is one of those uber creative souls that can turn anything into something beautiful. And when I say “anything I mean it. The beautiful picture below is of the tag while it was still a work In progress. A less purdy picture below his masterpiece shows the finished tag–amazing what a little more ink and embellishment does to a piece of art. Supplies: #5 manila tag; Peacock Feathers Distress glitter; Cricut die cut music note scrap-book paper; fussy cut butterfly from scrap-book paper; white seam binding; Distress sprays in Crushed Olive and Peacock Feathers; Distress stains in same colors; dimensional foam adhesive; various Distress Inks in blues and greens and Vintage Photo; script stamp; polka dot stencil; dimensional flower embellishment. Creative Details: First I stenciled the tag using a polka dot stencil. I used Peacock Feathers Distress Ink and some Crushed Olive Distress Ink. I also added a squirt of Tattered Angels spray leftover from eons ago. I say, “squirt” because I love the color but the nozzle was partially obstructed which made for a bad spray. In any case the color worked perfectly. I edged the tag in matching Peacock Feathers Distress Ink. After the first layer dried I stamped the tag with a script stamp in Vintage Photo Distress Ink. I stained the ivory seam binding by crushing it into a heap and spraying it with Crushed Olive Distress Ink and Peacock Feathers Distressed Ink. While I waited for the binding to dry I fussy cut the butterfly and scrounged around in my die cut stash for some interesting shapes. 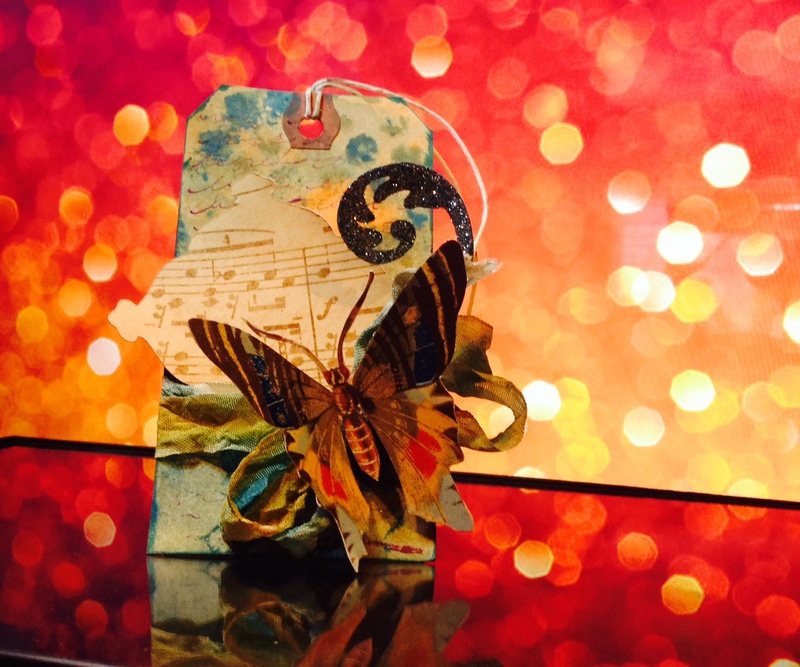 I found a great swirl feathery die cut scrap and a music note die cut. I glittered the swirl feather in Peacock Feathers Distress Glitter. And because I can never leave well enough alone I added some silver-blue glitter from my stash. I like the dimension different glitters give. I almost always mix my colored glitters. Once everything was dry I continued layering. I tied the seam binding around the bottom of the tag about a 1/4 of the way from the bottom. Then I hot glued the butterfly on top of the bowed binding. 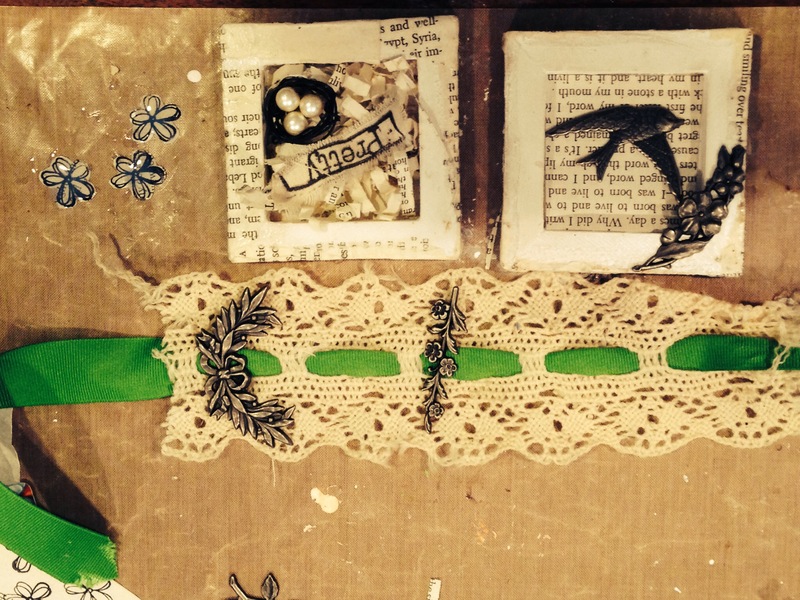 I then layered in the glittered piece and the music not die cut. This is when my boy got a hold of the tag and took that stunning photo above. Finally, I tied some more of the fab died seem binding to the top of the tag, layered a dimensional flower embellishment to the music not die cut; edged the die cut with a Distress Vintage Photo Marker–I couldn’t use an ink pad as the piece was already adhered to the tag. Small-curvy die cut called for a marker edging job. Never as tidy or as dark but worked well with this tag. Now I call the tag done. Hi. My boys including the big boy went for a winter weekend away. I stayed home and worked through a creative blitz. I dropped them off at their meeting point at 6 AM, I designed and created all day and night. I finally called it quits at 12:08 am. 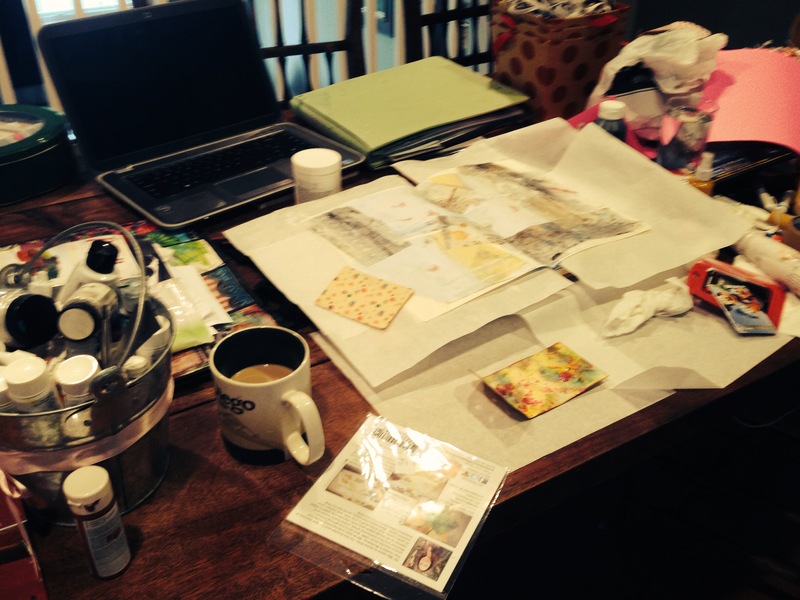 I just love creative days, don’t you? 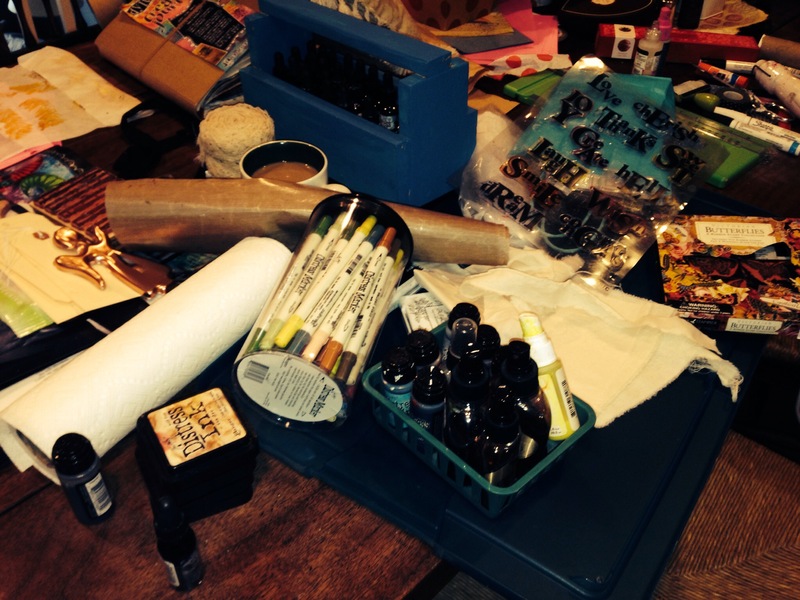 It was one long glorious day of crafting, creativeness and art. I worked on eight projects. I started six new projects. And I finished six projects. Two of the new projects I started aren’t finished, but that’s a-okay. They will be finished by the end of this week. Yippee! Nothing like completing a project unless its starting a project. Below are some images of what my day looked like! I loved my day! Thank you! It was a blast! Hi. So this weekend I worked on some great creative pieces. 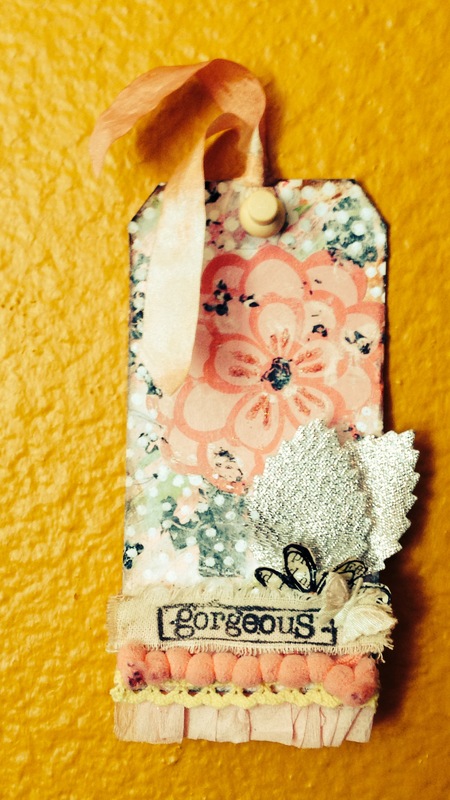 One of these creative endeavors resulted in this very pretty tag. 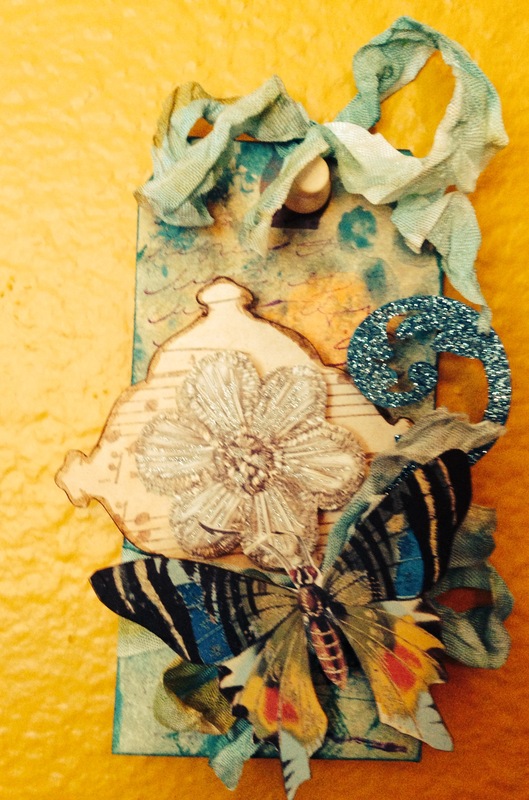 It is inspired by the beautiful, warm spring-like weather we are enjoying in Southern Cal. It may be snowing elsewhere but here it is 80. So, here is a tag that is part spring like and pink. A pinky spring tag! Creative Details : It’s all about the layers…I first stenciled a back ground using a circle stencil, polka dot stencil and a diagonal line stencil with various acrylic paints including Liquitex, Distress, Golden and assorted craft acrylics in bright pink, bright green and orange . Then I added black Distress and Golden acrylic as an accent. As the paint was drying, I stamped a torn piece of muslin with “gorgeous” in black ink. I made sure to fray all sides of the muslin. 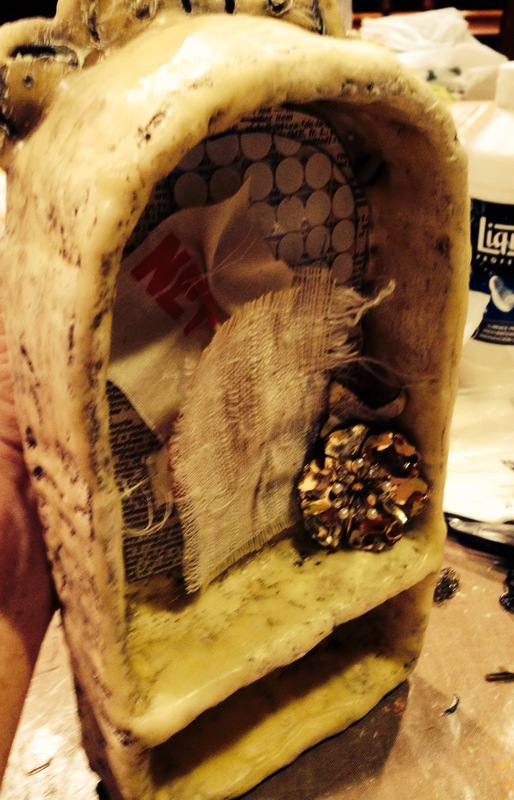 I glued down the pink ball embellishment with hot glue. Then I added the ivory crochet ribbon under the balls. I hot glued the muslin to the top of the pink ribbon. I mod podged the pink flower to the tag being careful not to get any gluey stuff on the muslin. While the tag was drying I dug through my embellishments stash and found the perfect metallic silver leaves. I attached the leaves with hot glue under the muslin. I found a little fabric butterfly and added it to the top of the muslin. I tucked in a homemade embellishment I made– a flower I stamped on top book paper, fussy cut and covered in glossy accents. The tag still needed something so I added a ruffle of pink crepe paper. I ruffled it without concern for exact ruffles or even spacing on the back of the tag using hot-glue. I trimmed up the bottom of the ruffle so it was even. Then finally I added black rub-ons and polka-dotted the entire tag except the flower and embellishments with a white acrylic Sharpie Paint Pen. And finally I added a piece of ivory binding ribbon I stained with Distress Stain through the top hole of the tag. A perfectly pink spring tag.